Perfect for the season, the word “eerie” is the theme this week for the photographic challenge brought to us by WordPress. My entry takes us to Disneyland, that theme park in Anaheim, California, where the family and I like to spend part of our summer vacation when we’re in transit from wherever we have been to wherever we are next going. 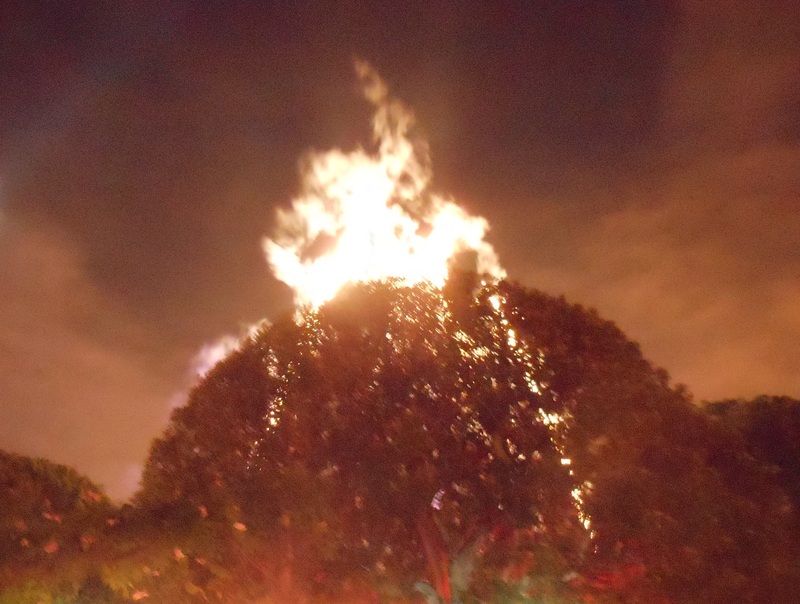 This looks like a tree on fire but without being consumed, but of course that can’t be what is transpiring. Actually, as with most things eerie (actually, with all things eerie) the explanation is more mundane. Every night, at half past nine, Disneyland has a fireworks show. For every other year we have spent at Disneyland, we have viewed this spectacle from the front of Sleeping Beauty’s Castle. For this year, we changed it up and decided instead to view the spectacle from behind the Castle and we were parked outside of the Storybook Land ride (that’s the one where the little boats go through Monstro’s mouth). Because of our new vantage point, there was a patch of trees that semi-blocked some of the pyrotechnics for us. This shot (one of many that I took that capture this effect) shows the lingering afterglow of one set of fireworks as it exploded behind the tree. A trick of the light and treat I’m proud to show off. “Like Christmas in July” is a phrase common in the United States. Down here in Peru, that phrase can be turned on its head because for the past few weeks it has felt like “The Fourth in December”…as in the Fourth of July. All of this firework-related news and commerce is due a Peruvian tradition that begins tonight. The carol “Silent Night” has no meaning in Peru because when midnight strikes tonight and Christmas Eve moves into Christmas Day, citizens all over the country light off their trove of fireworks. We were in Cusco last year when the rockets went off. I am curious to see what time I will be able to finally drift off to sleep here in the larger city of Lima with all the bombs bursting in air. Finally, and tho’ it’s been said many times, many ways…. Feliz Navidad and to all a good (and quiet) night.